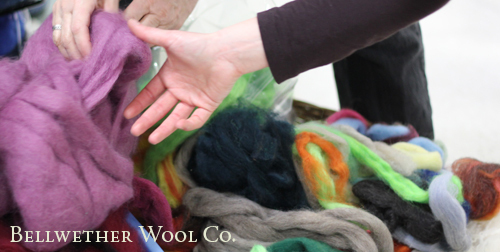 Looking for a great supplier of roving? Want to find an organic seed company in the Pacific Northwest? Just looking for some great blogs to read or some quick tips on how to live sustainably? Check out my favorite resources by category, and feel free to leave a comment with YOUR favorites as i’m adding to this list all the time. Be sure and check out our “blogroll” in the sidebar for our favorite homesteading, cooking and sustainability blogs. Wild Fermentation : a great online companion to the book. What’s That Bug.com: id that pest or companion in the garden BEFORE you squish! Planting an Asparagus Bed – great for food and an attractive screen! Gardening for mental health: bacteria in the soil as good as Prozac? Sustainable Farming Connection – so many great tips and links! Farm Stay USA – List of farm stays in the U.S.
Interweave: Publishers of art and craft magazines, books, shows and more. Mosaic Farms, Philomath, OR. A farming model we hope to follow in our own hog ventures. Rabbit genetics – get your Punnet squares ready! HELP I read your post on essential oils and pets. My friend made the mistake of brushing her dog’s teeth with way too much clove oil and now he throws up and has diarrhea and is breathing heavily.She has NO money for the vet. Can you PLEASE email me and tell me some remedies we could use? Is plain yogurt something we could try to feed him? I’m very sorry but this is way beyond my knowledge. I know this site presents quality depending articles or reviews and additional material, is there any other web site which presents these kinds of information in quality?